General Witold Urbanowicz is the legend of Polish Air Force. He was the second on the list of best Polish fighter pilots with 17 confirmed kills and the sole Polish Air Force fighter pilot who shot down aircraft of the Imperial Japanese Army Air Force. Officially he was credited with two kills (two Nakajima Ki-43) but he claimed that he actually shot five more, but those were not approved as he did not have any witnesses. Most of his victories he scored during the Battle of Britain flying with No. 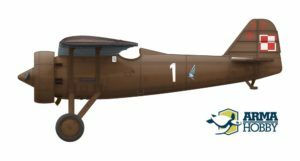 303 Polish “Kościuszko” Squadron – 13 in total. Nine of them while flying Hawker Hurricane Mk.I RF-E/P3901. Hurricane RF-E/P3901,Witlold Urbanowicz’s most famous aeroplane with nine Luftwaffe aircraft shot down during Battle of Britain. Artwork by Marcin Górecki. Before he became a member of this famous squadron, Witold Urbanowicz, similar to other Polish fighter pilots, joined a British unit. Having finished a training at the No.6 Operational Training Unit in Sutton Bridge he was posted to No. 145 Squadron in RAF Tangmere where he came on the 2nd August 1940. His stay at this unit was rather short as on the 14th it was moved to Scotland after sustaining heavy losses in combats fought between 10th and 12th August 1940. During this short period Urbanowicz shot down two German aircraft – on the 11th one Messerschmitt 109 and on the 12th one Junkers 88, and gained important experience of RAF combat tactics. His rest in Scotland lasted only 7 days. On the 21st he was posted to No. 303 in RAF Northolt near London where he took up a post of the “A” Flight commander. Photo of Witold Urbanowicz, wikipedia. Although a few years immediately before the war Witold Urbanowicz has spent in service of the instructor in Polish Air Force school in Dęblin, to the “Kościuszko Squadron” he returned like to his home. Earlier, since March 1935 he was a pilot of the 111. Fighter “Kościuszko” Squadron in Warsaw, which traditions and unit marking the “303” inherited, and since 1st April 1936 Urbanowicz was a deputy-commander of the Squadron, led then by Zdzisław Krasnodębski. In August 1940 Krasnodębski was commander of the “303”. Colour profiles (from left) one of early series PZL P.7a from 111. Squadron in 1935 and late series P.7a from the Air Force Cadet Officer’s School at Dęblin, aeroplane attributed to Witold Urbanowicz, 1938. Their markings are included in model kits PZL P.7a #70005 i #70006, please check their availability in shop link. When Urbanowicz arrived, the unit still had training unit status which was very frustrating for experienced Polish pilots. Fortunately Lt. Ludwik Paszkiewicz’s famous insubordination on the 30th August convinced British authorities that there is no sense to keep them training. On the 31st August No. 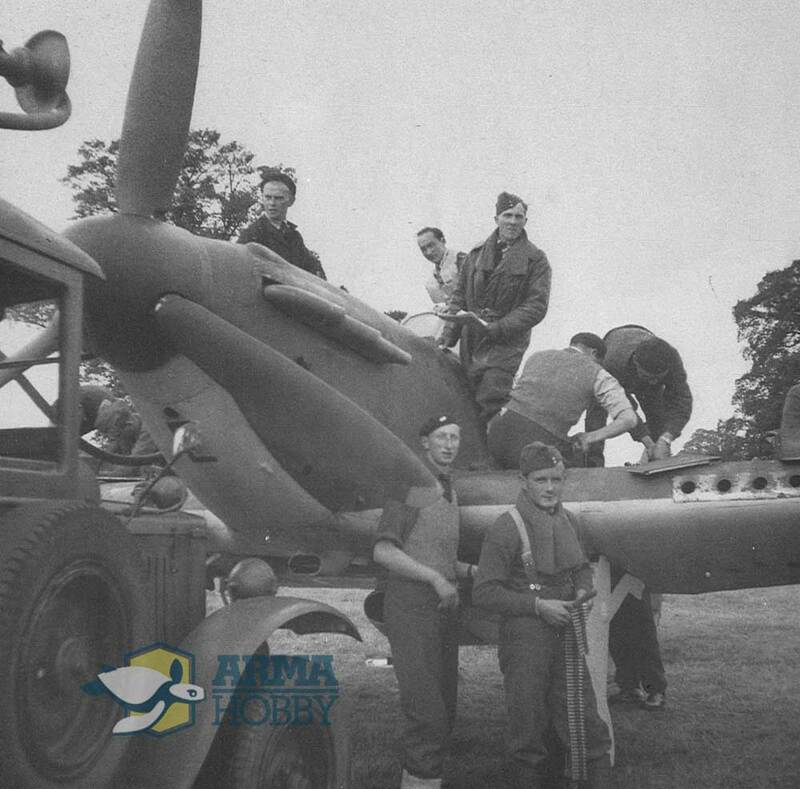 303 Squadron became operational. Urbanowicz first combat missions finished without success. On the 6th September pilots fought one of the hardest combats during the Battle and claimed seven enemy aircraft shot down. But it was a very costly victory as three Hurricanes were lost and three were damaged. Unit also lost three pilots injured, including its CO, S/L Zdzisław Krasnodębski. His aircraft was set in flames and the pilot suffered severe burns. In this combat Witold Urbanowicz shot down one enemy aircraft. After that mission Urbanowicz, as the highest rank, became Squadron’s acting CO. It was approved by the British command, including AVM Keith Park. However, Polish authorities did not approve it and sent Maj. Jerzy Orzechowski but he was the CO only formally and only a few days. Apparently Polish pilots did not like their new commander and Urbanowicz was posted back. The following days till the 15th August he flew several missions claiming three Dorniers 215. 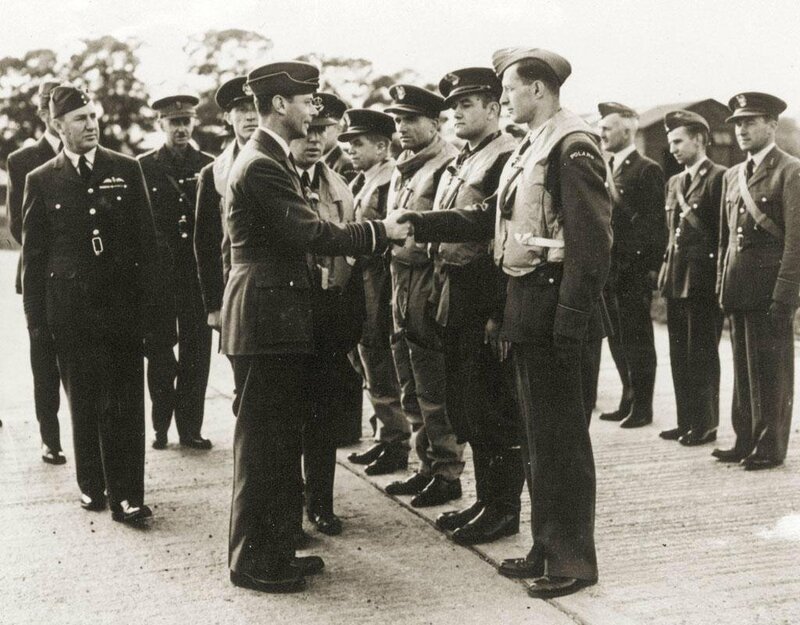 His Majesty The King George VI visiting 303 Squadron, 26th September 1940. Behind the King on left is W. Urbanowicz. Photo – ©Polish Embassy – London. On the 26th Witold Urbanowicz flew Hurricane RF-E/P3901 for the first time. That day was very special for the Squadron because it was visited by His Majesty The King George VI. Pilots were at readiness, what can be seen in the photos taken during that visit, and were completely surprised. Soon after king’s leave the Squadron scrambled and was directed against enemy raid heading Porthsmouth. 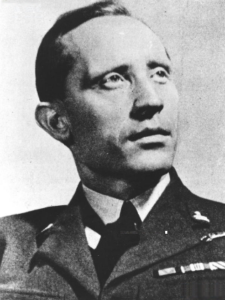 One Flight attacked German fighters and the other, led by Urbanowicz, attacked bombers. Urbanowicz chose one He 111 and fired long burst which sent the bomber to the sea. Four Jerrys in One Day! 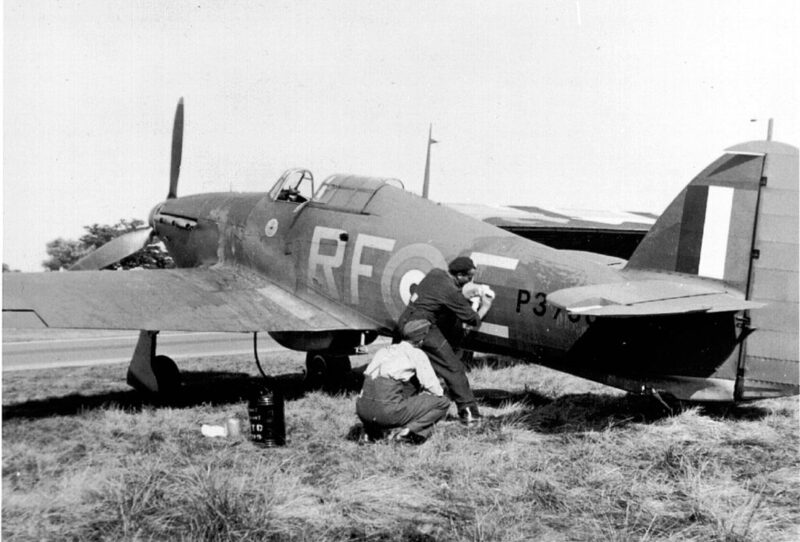 In the afternoon the Squadron scrambled again but this time only 6 Hurricanes could be sent. The Ops directed pilots against enemy raid that was attacking London. However, they intercepted enemy while it was heading back to France. W. Urbanowicz attacked Ju 88 and shot a few bursts. German bomber hit the Channel near Brighton. A few moments later Polish pilot made a head attack on another bomber and also hit the sea. According to his report enemy aircraft did not emit smoke, so he assumed that his bullets killed or severely wounded German pilot. 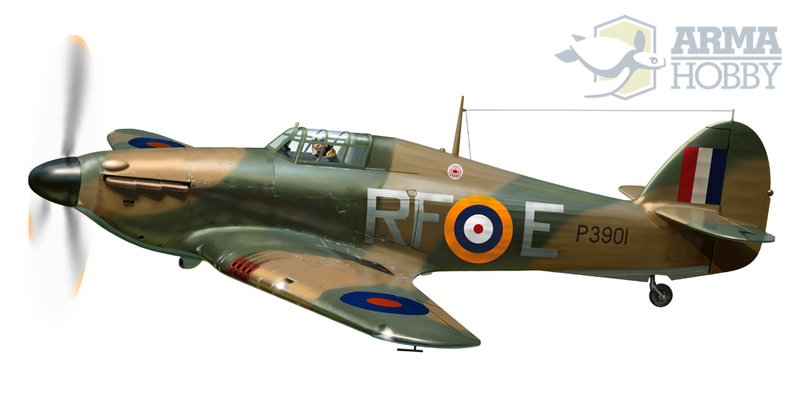 On the 29th Urbanowicz flew Hurricane RF-E again but without a contact with the enemy. P3700 – first of series, lotst in combat on 9th September 1940, pilot SGT Kazimierz Wünsche bailed out and landed safely. Hurricane from Historic Aircraft Collection was painted in markings of that aeroplane. ©Polish Embassy – London. P3577 – short living one, from 12th to 15th Septmeber 1940. Aeroplane lost with pilot SGT Michał Brzezowski killed in action. P3901 – most succesful one, used in Squadron from 18 September to 29 December 1940. Flown by W. Urbanowicz (9 victories) and J. Zumbach. Most probably this one (or V6757) was first time decorated with famous “Donald Duck” Jan Zumbach’s personal insygnia (se photo below please). SGT Stanisław Karubin achieved the latest victory flying this aerplane on 5th October 1940 . 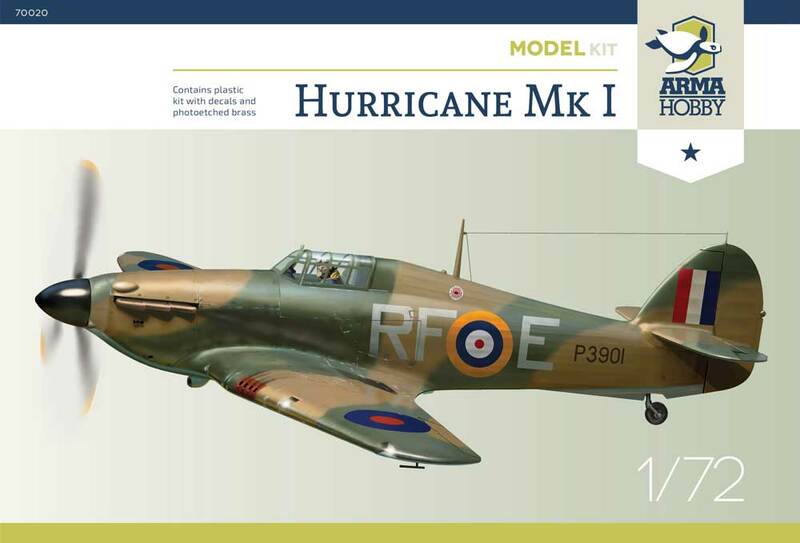 V6757 – the last one Hurricane Mk I marked RF-E used from 12th January to 2nd February 1941, przed przezbrojeniem na Spitfire. The 30th September was a very busy and successful day for Witold Urbanowicz. He took part in five patrols (first two without contact with the enemy) and shot down four enemy planes. At around 1.00 p.m. the Squadron was ordered to scramble and fifteen minutes later Polish pilots attacked Dorniers 215. Urbanowicz picked up one of them attacked but without success. Enemy bomber continued his flight towards France. Over the Channel two fighters approached the bomber. 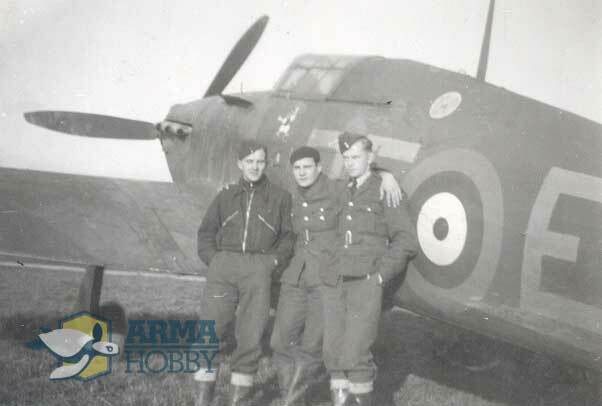 At first Urbanowicz thought that they were British but when he saw his mistake he shot down both of them from a short distance and then finished the bomber. Hurricane RF-E/P3901 (or V6757) with “Donald Duck”, the personal insygnia of P/O Jana Zumbacha in winter 1940. Note anti flame shields for night flights on fuselage after exhaust. Photo from Jacek Mainka collection. After the combat he returned to Northolt but did not have much time to catch a breath as at around 4.00 p.m. the Squadron was ordered to air and patrol the base area. But soon the unit was directed towards enemy raid heading London. In the Brooklands area the A Flight was bounced by Me 109s. During the combat Urbanowicz attacked and shot down one of enemy fighters. It was his last victory during the Battle of Britain. On the 20th October Witold Urbanowicz was posted to 11 Group in Uxbridge as a liaison officer. Later he was the CO of Polish 1st Firghter Wing in Northolt, air attaché in Polish Embassy in Washington and later joined 23rd Fighter Group USAAF in China. 11/01/2019 Dominik SędziakBlog, HistoryNo Comment	Hurricane.